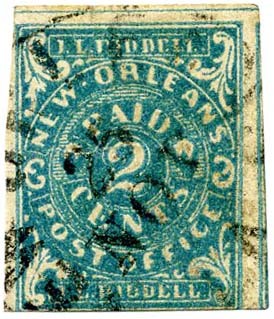 New Orleans, La., 2¢ blue #62X1, unused (no gum), tiny thin, Fine appearance, SCV $225. $110. 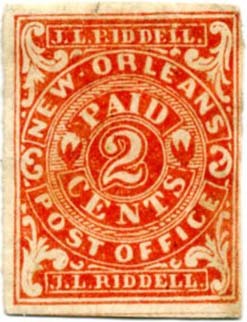 New Orleans, La., 2¢ red #62X2, unused (no gum), small tear at top, small filled thin, Very Fine appearance, SCV $190. $70. 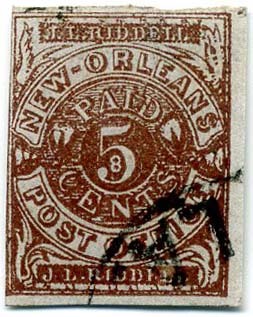 New Orleans, La., 5¢ brown on white #62X3, used with town cancel, SCV $200. $150. 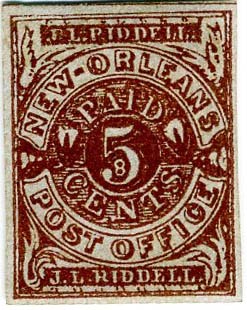 New Orleans, La., 5¢ brown on white #62X3, clear crisp impression, fresh, used with PAID cancel, tiniest filled thin, SCV $200. $80. 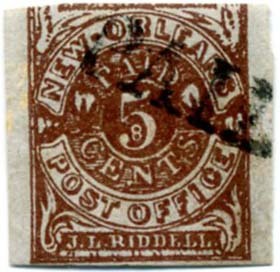 New Orleans, La., 5¢ red brown on bluish #62X4, used with town cds, filled thin, rich color, SCV $200. $80. 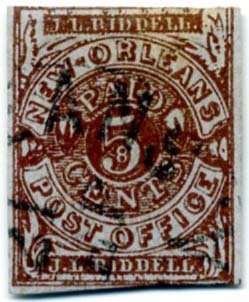 New Orleans, La., 5¢ red brown on bluish #62X4, used with PAID straightline cancel, tiny thin, SCV $200. $90. 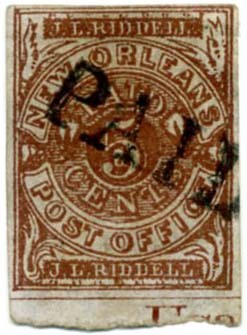 New Orleans, La., 5¢ red brown on bluish #62X4 with PART IMPRINT at bottom, used with PAID straightline cancel, signed “Dietz,” SCV $200+ $120. 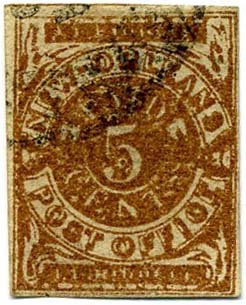 New Orleans, La., 5¢ yellow brown #62X5, unused (no gum), tear, thin, faulty Spacefiller, Very Fine appearance, SCV $160, $50. 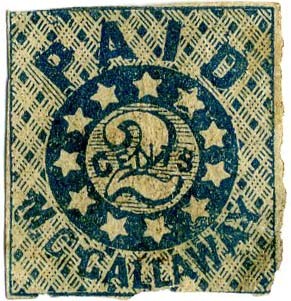 Memphis, Tenn., 2¢ blue #56X1 CONSTANT VARIETY, Position 6 (as plated by Pratt in 1929 and publicized by Dietz but not listed – we need to change that – SCRATCH across GALLA of MCGALLAWAY as well as notch in left frame), no gum, creasing as usual for this thin pelure paper, SCV $100+ $150. 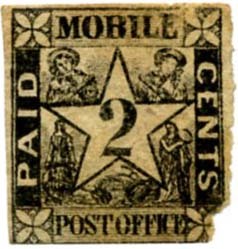 Mobile, Ala., 2¢ black #58X1, unused, part original gum, staining and faults with lower right corner chip, SCV $2,250. $400. 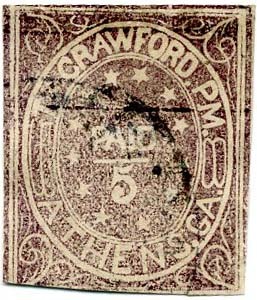 Mobile, Ala., 5¢ blue #58X2, tied neat double circle town cancel Sep. 20, 1861, on small piece, small lower left corner stamp repair, SCV $400. $250. 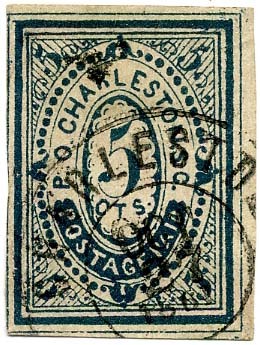 Charleston S.C., 5¢ Blue #16X1, Type M, large margins showing 3-1/2 outer frame lines, ample at upper right, tied by Nov. 19  cds on small piece, light horizontal crease at bottom otherwise Very Fine, Very few of the Charleston provisionals extant are sound, 2014 SCV $ 850. $675. 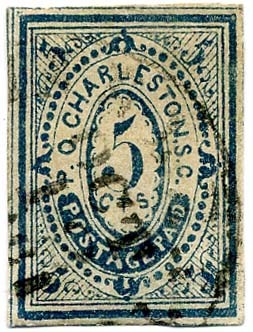 Charleston S.C., 5¢ Blue #16X1, Type C, ample margins, Oct. 1  cds, Fine, Very scarce in sound condition, 2014 SCV $ 850. $900. 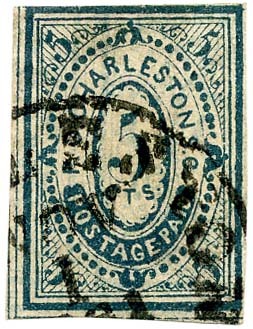 Charleston S.C., 5¢ Blue #16X1, Type P, large margins showing two outer frame lines and traces of a third, neat Oct. 12  cds, thin spot at bottom left otherwise Very Fine, Very few of the Charleston provisionals extant are sound, 2014 SCV $ 850. $550. 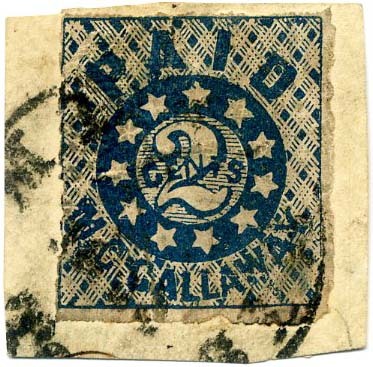 Charleston S.C., 5¢ Blue #16X1, Type E, large margins with outer frame lines all around, neat Oct 27, 1861 double circle, three horizontal creases, Very Fine appearance, Very few of the Charleston provisionals extant are sound, 2014 SCV $ 850. $625. 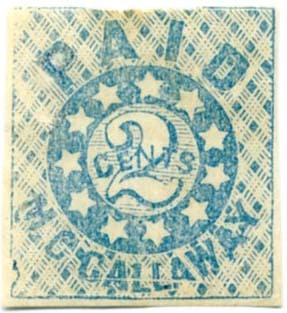 Charleston S.C., 5¢ Blue #16X1, Type E, ample margins, rich color, January 1862 circular datestamp, few thins, light horizontal crease, Very Fine appearance, used in January after the General Issues were readily available, Very few of the Charleston provisionals extant are sound, 2014 SCV $ 850. $500. 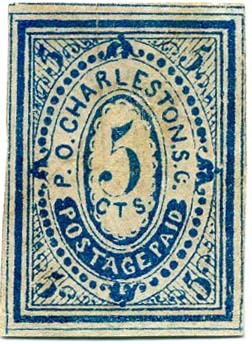 Charleston S.C., 5¢ Blue #16X1, Type D, large margins showing three outer frame lines to just in at upper right, Nov. 19 circular datestamp, thin spot at top, Fine appearance, with 1972 CSA certificate, Very few of the Charleston provisionals extant are sound, 2014 SCV $ 850. $525. 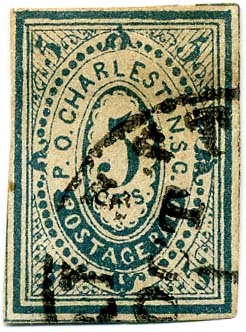 Charleston S.C., 5¢ Blue #16X1, Type L, large margins to just touched, rich color, showing faint second impression shifted approximately 6 mm, a kiss print, small corner creases and small thin spots, appears Very Fine, a fascinating stamp worthy of additional research, illustrated in the Calhoun book on p. 72, Scott does not list any printing varieties for this issue, Scott Catalogue Value as normal used stamp, Very few of the Charleston provisionals extant are sound, 2014 SCV $ 850+ $525. 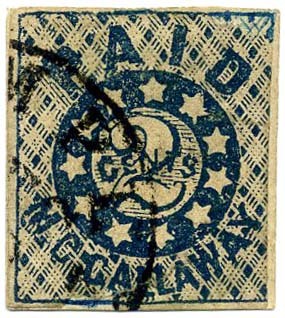 Mobile, Ala, 5¢ blue #58X2, used, rebacked with left margin added, Very Fine appearing. SCV $450. $200. 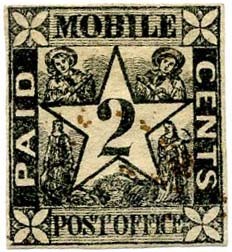 Mobile, Ala, 2¢ black #58X1, used, top margin added, small tear, thin, crease, rare Spacefiller, SCV $1,200. $200. Knoxville, Tenn., 5¢ brick red #47X1 tied on piece, small sealed tear at upper right, 1983 PF Certificate, SCV $1,400. $900. 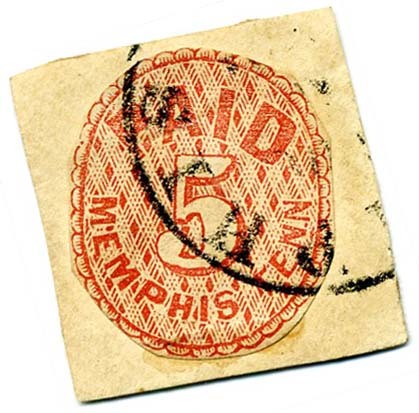 Memphis, Tenn. 2¢ blue #56X1, used, rebacked over faults, portions of design edge drawn in, Dietz signature on verso. SCV $1,250. $500. 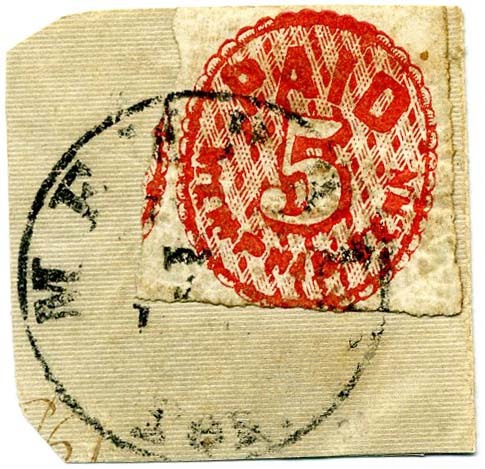 Memphis, Tenn., 5¢ red #56X2, tied on small piece of illuminated cover by town cds, SCV $250. $250. 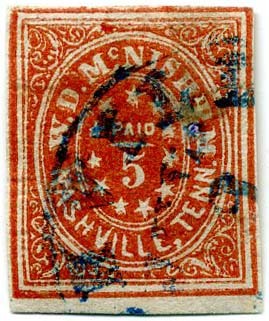 Memphis, Tenn., 5¢ red #56XU3, cut square from entire, tied by town cds, SCV $3,000 as full entire. $500. 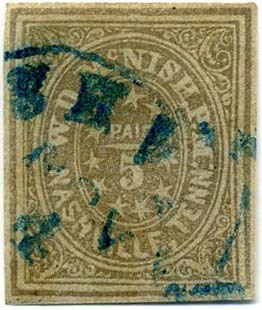 Nashville, Tenn. 5¢ carmine #61X2, part original gum, faulty, signed Dietz, SCV $1,000. $550. 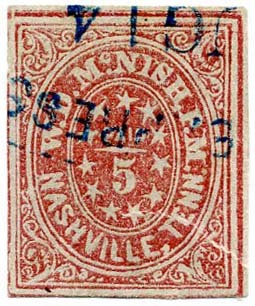 Nashville, Tenn. 5¢ brick red #61X3, used with blue town cancel, faulty, SCV $1,000. $550. 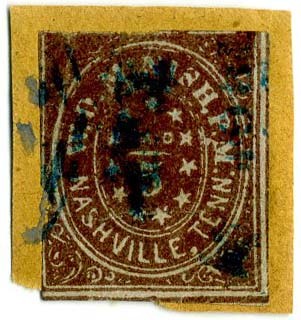 Nashville, Tenn. 5¢ gray #61X4, used with blue town cancel, tiny tear at right edge, perfect margins, Extremely Fine appearance, THE GRAY SHADE OF NASHVILLE IS FAR RARER THAN THE OTHER NASHVILLE SHADES. SCV $1,500. $1,500. 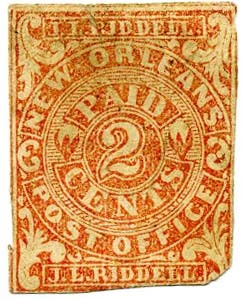 New Orleans, La., 2¢ red #62X2, original gum, heavily hinged, small thin, Very Fine appearance, SCV $190. $100. 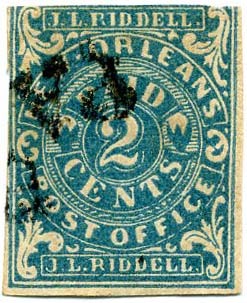 New Orleans, La., 2¢ blue #62X1, used, nice deep color, Fine, SCV $550. $300. 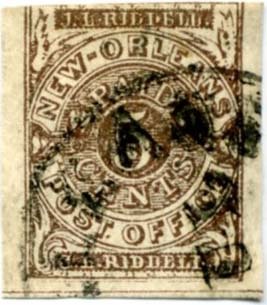 New Orleans, La., 5¢ brown #62X3, used on small piece by straightline PAID cancel, SCV $200. $150. 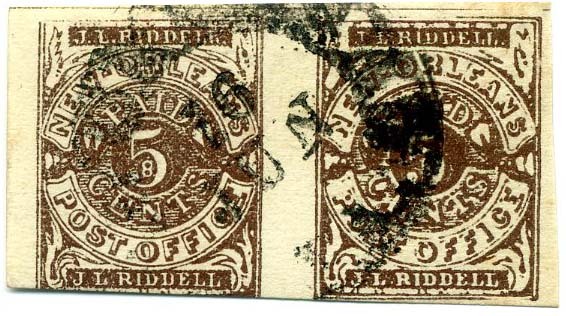 New Orleans, La., 5¢ brown #62X3 pair, used with town postmark Jun 16, fresh, SCV $425. $350. 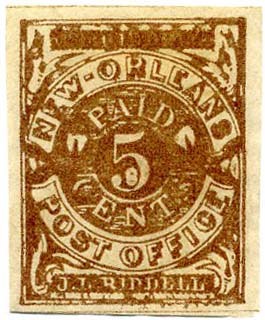 New Orleans, La., 5¢ OCHRE #62X3b, used with PAID straightline cancel, small owner backstamp, Very Fine, Scarce shade! SCV $625. $600. 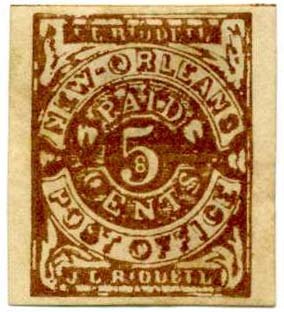 New Orleans, La., 5¢ red brown #62X4, unused (no gum), Very Fine, SCV $325. $300. 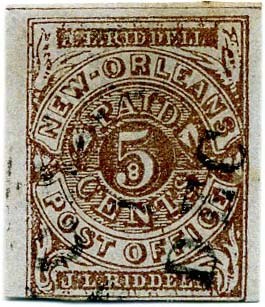 New Orleans, La., 5¢ red brown #62X4, used with light town cds, Fine, SCV $200. $150. 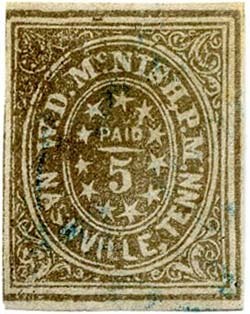 Nashville, Tenn. 5¢ violet brown #61X5, used with light blue town cancel, small edge thin at top, Very Fine appearance, SCV $750. $350. 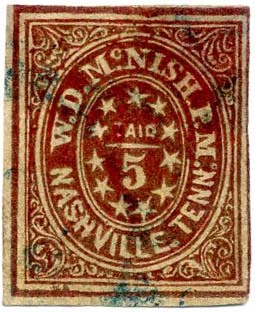 Nashville, Tenn., 5¢ light carmine #61X2, used with blue express company oval, large tear at lower right, 2011 CSA certificate, Very Fine appearance, Ex Hind, SCV $650. $350. 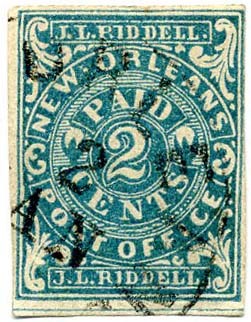 New Orleans, La., 2¢ blue #62X1, used with light town postmark, corner crease at lower left, otherwise Very Fine, SCV $550. $260. 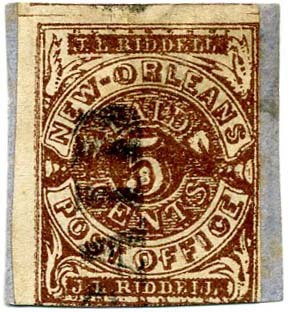 New Orleans, La., 5¢ red brown on bluish, #62X1, used with edge of town postmark, tiniest thin at top, SCV $200. $100. 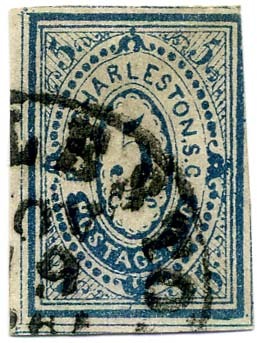 Charleston S.C., 5¢ Blue #16X1, horizontal pair, Calhoun Types D-E, original gum, bright color, large margins including part of adjoining stamp at left and right sheet margin, rich color, thin spots, Very Fine appearance. 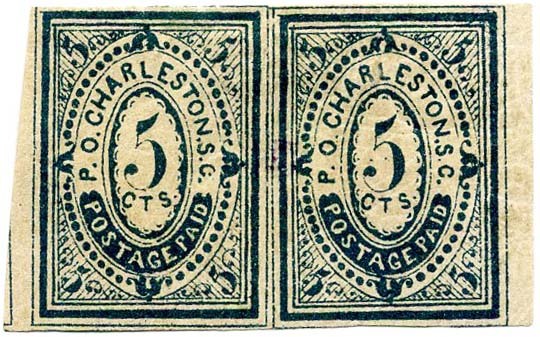 Apart from the unique block of fifteen, this is the only reported unused multiple of the Charleston postmaster's provisional. 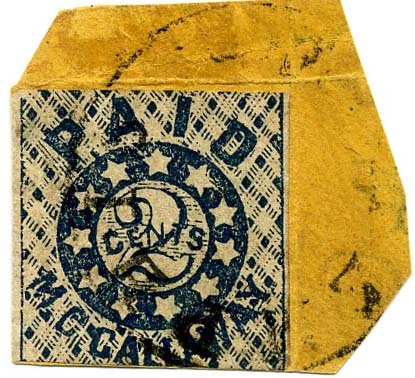 Prior to the discovery of the block of 15 in 1979 (Kaufmann Auction), this was the only recorded unused multiple. 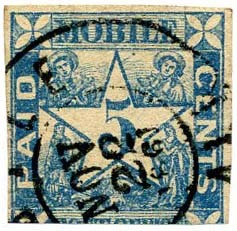 Two backstamps (one just shows thru at center). Illustrated in the Calhoun book on p. 60. Ex Hiram Deats, Caspary, Calhoun and Stanley. SCV $3,250. $4,000. 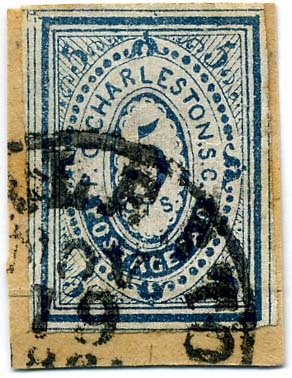 Charleston S.C., 5¢ Blue #16X1, unused, no gum, faint toning, shallow thins and light crease, SCV $1,400. $950. Memphis, Tenn. 2¢ dark blue #56X1, tied on piece with neat town postmark, slight wrinkling, Fine, 1983 PF certificate, SCV $1,250. Ex Brandon and Stanley. $900. Nashville, Tenn., 5¢ gray #61X4, ample margins to just in at left, rich color in this scarce and distinctive shade, light blue town cancel, fresh and Fine, ex Carroll and Stanley, 1986 PF certificate, SCV $1,500. $1,000. 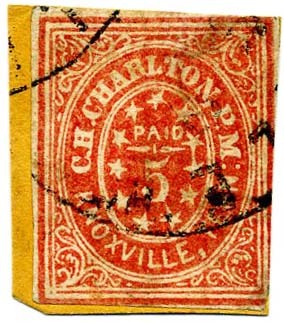 New Orleans, La., 5¢ ochre #62X3b, used with light town cancel, thin at top, Scarce shade, SCV $625. $300. 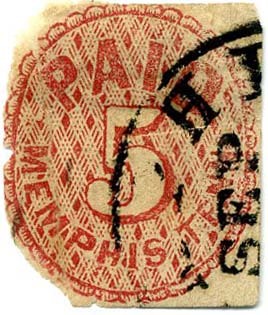 Memphis, Tenn., 5¢ red #56X2 used with partial town cancel, scissor cut at upper right, SCV $250. $100. 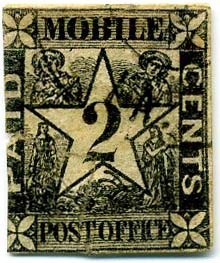 Mobile, Ala, 2¢ black #56X1, unused (no gum), 4 evenly balanced margins, fresh but for tiny rust color stains and no trace of a cancel, small thin, Very Fine appearance, SCV $2,250. $1,500. 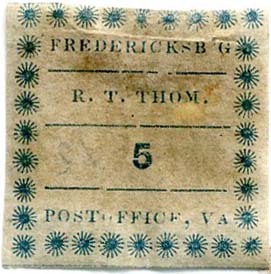 Fredericksburg, Va., 5¢ blue #26X1, unused, no gum, heavy hinge remnants over faults (crease and thin, bit hinge stained, SCV $900. $190. 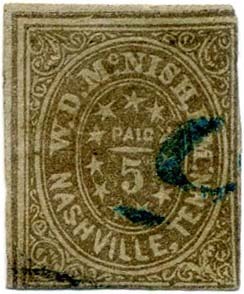 Nashville, Tenn., 5¢ gray, #61X4, used with blue numeral “5,”, tiny edge of black cds at lower left,Scarcest of the Nashville shades, SCV $1,500. $950. 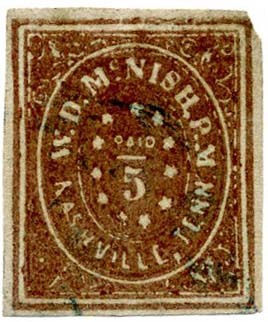 Nashville, Tenn., 5¢ violet brown, #61X5, tied on small piece by blue town postmark, pre-use creases, SCV $750. $250. 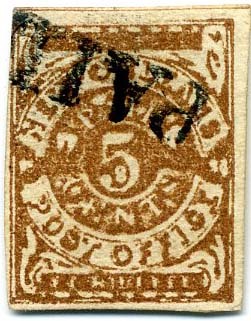 New Orleans, LA 5¢ yellow brown #62X5, unused, no gum, small paper inclusion at center, Very Fine SCV $160. $140. 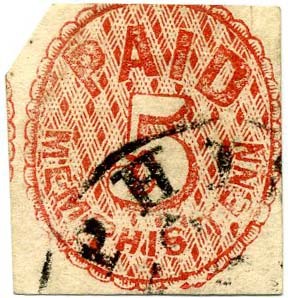 Memphis, Tenn., 5¢ red #56X2 cut to shape (light crease at bottom) and tied by neat town cancel on piec, SCV $250. $125. 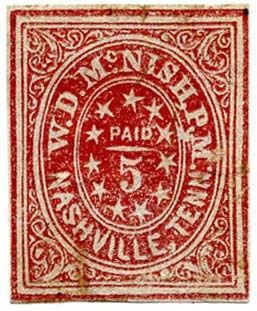 Nashville, Tenn., 5¢ carmine, #61X2, used with blue town postmark, small shallow thins, rich color, SCV $650. $200. 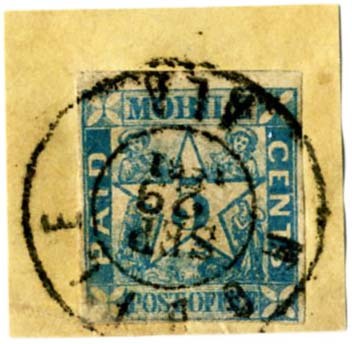 Memphis, Tenn., 2¢ dark blue #56X1 tied on small piece by town postmark, defective corner lower right (difficult to impossible to see – per 1985 PF certificate, Ex Gallagher, SCV $1,250. $450. 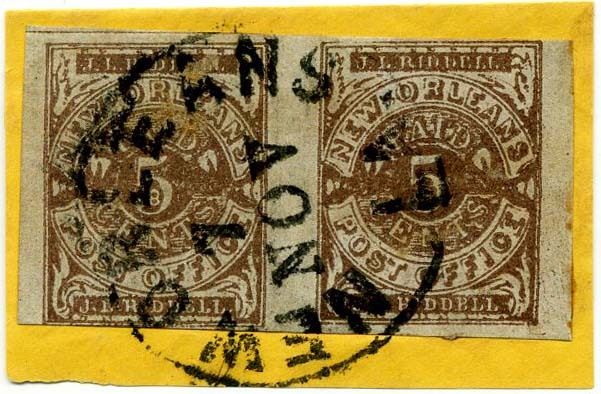 New Orleans, La., 5¢ brown on bluish #62X4 variety, vertical pair with FILLED IN FRAMES variety, tied on small piece by neat town postmark, signed Colby and faintly backstamped J. H. Stolow. $300. 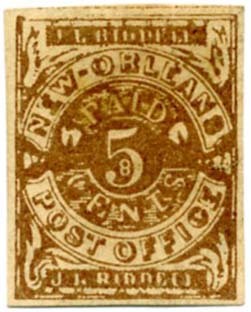 New Orleans, La., 5¢ brown on bluish #62X4 pair boldly tied by 7 NOV New Orleans postmark on small piece. $350. 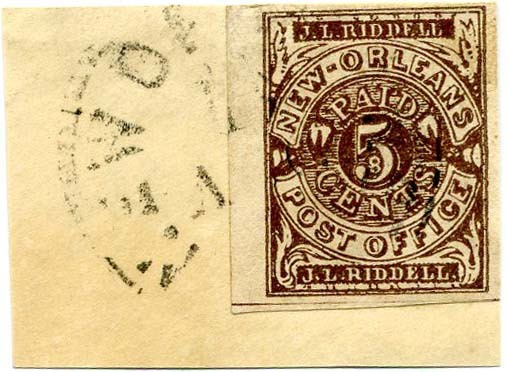 New Orleans, La., 5¢ brown #62X3 with ample to huge margins all around, tied by light town cancel on piece, Very Fine. SCV $200. $220. 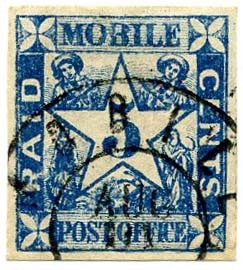 Mobile, Ala., 5¢ blue 56X2 used with neat Mobile, Ala, Nov. 22, 1861, double circle datestamp, SCV $450. $250. 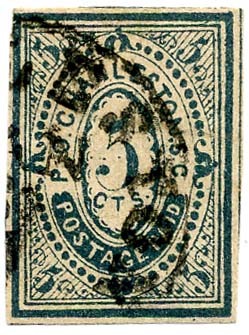 Memphis, Tenn., 2¢ blue 56X1, unused (no gum), creases, tiny thin, faulty Spacefiller, SCV $100. $25. 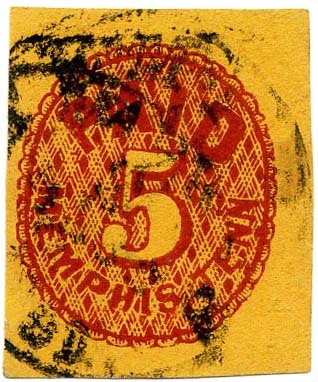 Memphis, Tenn., 5¢ red 56X2, used with town postmark, small tears and creases, faulty Spacefiller, SCV $250. $50. 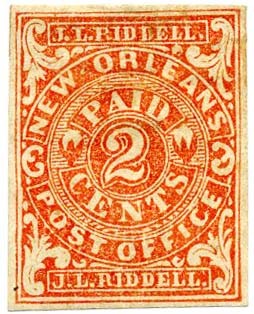 New Orleans, La., 2¢ red 62X2, unused (no gum), soiled, creases, thins, faulty Spacefiller, SCV $190. $50. 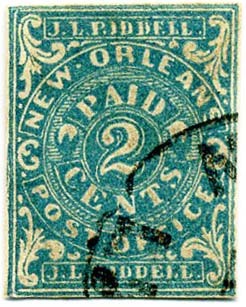 New Orleans, La., 2¢ blue #62X1, light town postmark, Fine, SCV $800. $400. 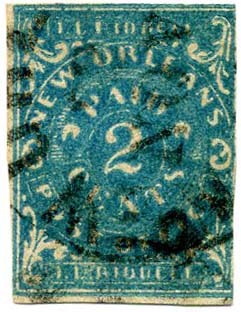 New Orleans, La., 2¢ blue #62X1, used with PA[ID] cancel, Fine, SCV $800. $400. 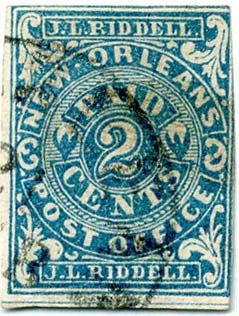 New Orleans, La., 2¢ blue #62X1, light town postmark, Fine-Very Fine, SCV $800. $500. 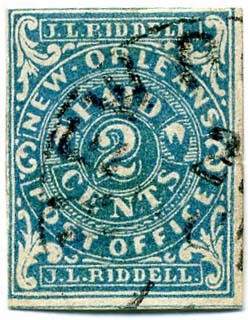 New Orleans, La., 2¢ blue #62X1, light town postmark, tiny scissor cut at lower left edge, Fine-Very Fine, SCV $800. $500. 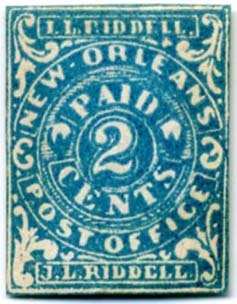 New Orleans, La., 2¢ blue #62X1, light town postmark, small thin otherwise Very Fine, SCV $800. $450. 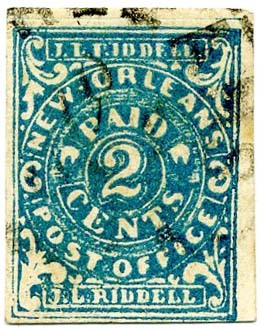 New Orleans, La., 2¢ blue #62X1, light town postmark, internal paper break at center, Fine appearance, SCV $800. $150. 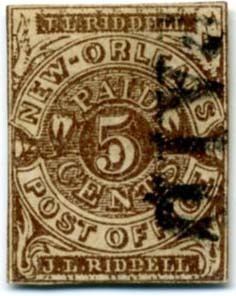 New Orleans, La., 5¢ yellow brown, #62X5, unused, no gum, Very Fine, SCV $160. $160. Athens, Ga., 5¢ purple #5X1, type 1, used, Fine, natural horizontal printing streak above value, 1958 Royal Philatelic Society London certificate. SCV $1,400. $600.